The Philadelphia Wings earned their first win of the season on Friday night after defeating the Rochester Knighthawks 15-14 in overtime. It was the first win for the reincarnated Wings, and somewhat of a love letter game to their fans who supported the team during their 0-6 start. “The [fans] have been backing us this year and it was time to repay the favour. We finally put it together and it was a great team win for the organization, the city and the fans,” said Blaze Riorden, who potted the winning goal. The game began with a Rochester goal by Cory Vitarelli less than a minute in. Kevin Crowley responded on a feed from Jordan Hall to tie the game up one. Jordan Hall then added a goal to his assist. Rochester scored three more in the first to Philadelphia’s one to lead 4-3. The second quarter started with a quick Rochester goal by Pat Saunders 37 seconds in. 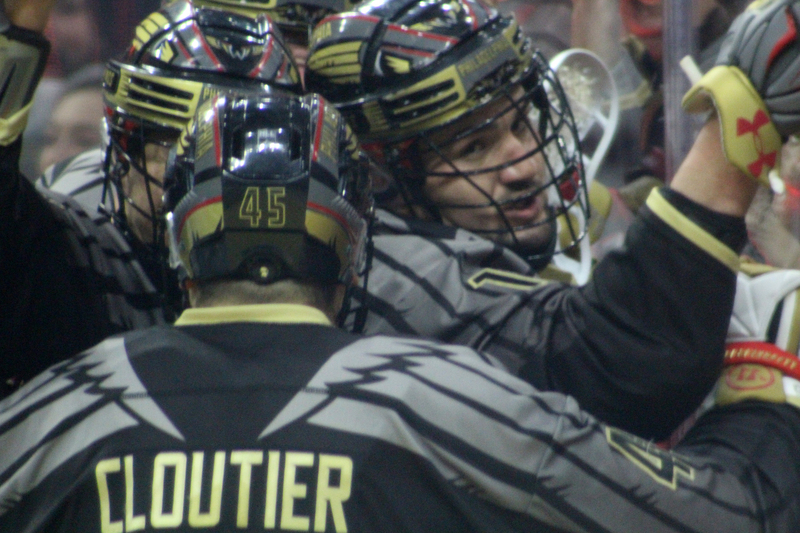 The rest of the quarter was all Philadelphia as the Wings outscored the Knighthawks 5-1. Josh Currier, who played with a spring in his step, had two in the quarter, both coming as he dove over the crease. Perhaps Currier felt he had something to prove to his old team. Also netting two for Philadelphia was Kiel Matisz, who continued to have another strong performance that carried over from last week’s stellar game. Philly led 8-5 at halftime. 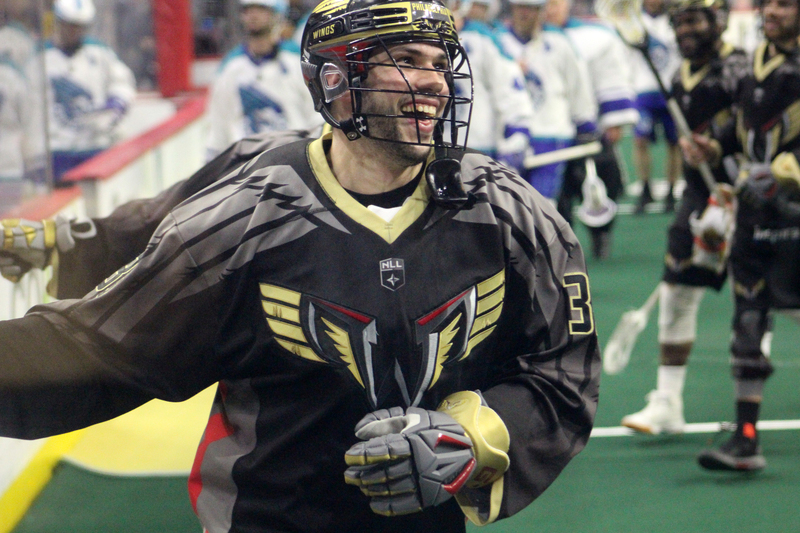 Vitarelli came back to life in the third quarter and netted two as the Knighthawks kept pushing. They scored three goals in under a minute late in the period to tie the game at 10. It appeared that Philadelphia was headed into another fourth quarter where the game would slowly slip away. Cody Jamieson scored twice less than a minute apart for a 12-10 lead. On both goals, Jamieson was left alone behind Philly’s net and scored as he dove around it. That prompted Wings’ coach Paul Day to pull Doug Buchan in favour of Davide DiRuscio. Buchan wasn’t playing badly, but Rochester had scored the last five goals so it was time for Day to light a fire under his squad. Day’s move paid off as the Wings roared back and scored four in a row for the 14-12 lead. The Knighthawks tied it with two late extra-attacker goals. Kyle Jackson scored with one minute remaining and Jamieson wired the ball through traffic with 21 seconds left. Overtime came and Trevor Baptiste won the faceoff, after which the Wings quickly called time out. Once play restarted, they took a shot which Kevin Crowley saved from an over-and-back loss of possession call to fire back into the offensive zone. Blaze Riorden slammed the ball into the back of the net with help from Chris Cloutier and Jordan Hall to give Philadelphia its first win of the season 31 seconds into OT. There were a few key differences between this week’s game and last week’s game. First, there were fewer physical altercations. In fact, there were only three penalties in the game, for six total minutes between both teams. Additionally, the Wings were able to play more as a team because there were fewer injuries, which allowed them to outlast their opponents. Baptiste dominated the faceoffs (Rochester was missing Jake Withers), the Wings had more shots and they were able to stay out of the box. The big goal scorers for Rochester were Cody Jamieson with four, Cory Vitarelli with three and Pat Saunders with three. Philadelphia had Kiel Matisz and Josh Currier with hat tricks. Matisz also added five assists on the night. Davide DiRuscio earned the win after playing 12 minutes in relief, though Riorden was quick to credit both goalies for their efforts. Day was quite pleased at the outcome and the win happening in Philadelphia, giving credit to the fans for their energy. The Wings next host the 1-5 Colorado Mammoth on February 9th back at Wells Fargo Center. Rochester visits New England at Mohegan Sun Arena on the same night.